The following tips and hints have been submitted from various Oblivion players from around the world. Many of them are quite useful and can help you in the PC or Xbox 360 version of the game. If you play this game a lot and use many weapons, you're limited to carrying items up to your capacity. Or, you don't want your weapons to slow you down, even if you're about 1/3rd's away from maxing out. This is a great method of carrying a lot of weapons, armors, potions, and/or misc items that you don't want in your own inventory. Try to beat down the horse until it is unconscious. Immediately, before it gets back up, go to the corpse and search the body like you would with normal enemies, etc. Usually, an unconscious character will only provide you with the option, "Talk", while the character is still on the ground. You can search the horse, push the left trigger button and drop in whatever you need carrying. This is far more than carrying everything you possibly can on your personal inventory while in battle. This works with the Xbox 360 and using the horse armor. 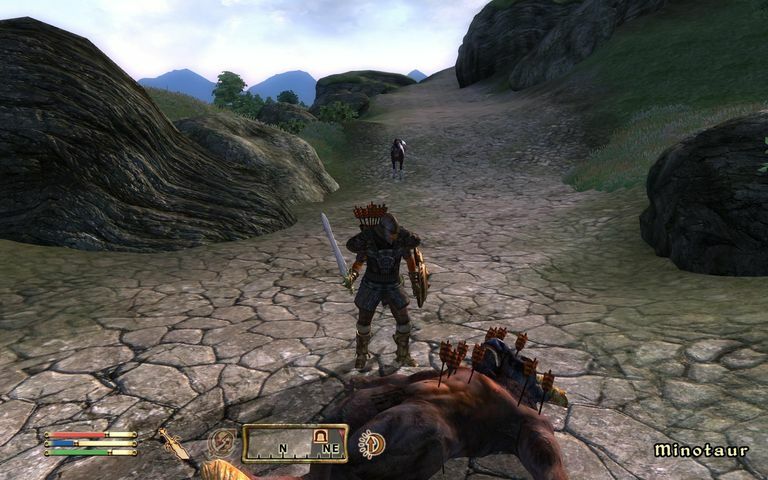 Submitted by: Anthony T.
Given the complex combat and wide array of enemies in Oblivion, it is vital that you keep an array of weapons available for your early encounters. Enchanted weapons show up fairly often after level 5 or so, so be sure to keep a fire-based enchanted weapon along with a shock-based, Magicka affecting, and simple unenchanted weapon on your person (an Ease Burden spell from Deetsan in the Cheydinhall Mages Guild can help with the weight). To duplicate any item in your inventory, all you need is a bow and at least 2 of any arrow type. To duplicate an item, simply draw your bow, and keeping your bow drawn, enter the inventory menu. Then you must unequip the arrows you have equipped (a message will appear saying you cannot unequip weapons until you are done attacking). After that, find the item you wish to duplicate and drop it. Now, when you exit the inventory the item you dropped to duplicate will appear, with however many duplicates you wanted (number of arrows equipped) and fall to the ground. To kill Umbra and get her armor/sword just jump on the broken pillar in the square and then shoot her. She gives you Umbra, the soul-eating sword. Submitted by: Niko G.
Being so open-ended, many gamers will try to play Oblivion in the same way they played Final Fantasy, or Neverwinter Nights, or Diablo, or any variation of the standard RPG. They think of it as playing a game with standardized functions and goals. Oblivion is meant to be played as if you were there, living the life of the character you've created. After listening to the viewpoints of those that don't like Oblivion but enjoy other RPGs, it all boils down to the idea of open interpretation. By this I mean when you're so used to being told what to do and following a storyline, you look for a story to guide you. In Oblivion, you make your own story. A great tip to help gameplay would be to realize that when you start the game up, you should let yourself go and make choices in Oblivion like you would make them in real life, and don't be afraid to make mistakes. Tired of always being over-encumbered? Well here are some tips for reducing that hassle. They require a somewhat higher alchemy and entrance to the arcane university. First, an easy way to solve the problem is to enchant a weapon or piece with a fortify strength or feather spell. A second way to solve the problem is alchemy. If you have a fairly high alchemy you can make feather potions that reduce weight by the hundreds for several minutes. You can drink multiple at once so you can hold higher than 1200 lbs for over 500 seconds. Submitted by: Ryan P.
In the quest where you have to kill ten wild bears for the farmer, the easiest way for a weak character to accomplish this is to wander until you find a bear, and then run as fast as you can back towards the farmhouse. Once there run into the fenced garden. The bear will chase you in. Then quickly run out before the bear can kill you and swing the door shut behind you. The bear will be trapped, and you can fire arrows or spells at him to kill him. Submitted by: Lucrezia W.
Once the player has risen through the ranks of the Arena and become Grand Champion, weekly matches for money against different monsters become available. The toughest monster one ends up fighting is the Minotaur Lord, up to three at a time. The trick to defeating them is to retreat back into the hall entrance to the Arena pit; the Minotaur Lords are simply too tall to follow after you, and lacking any ranged weapon, cannot reach you. Assuming you have enough arrows (at least 50 or so) and a bow, or alternatively, a decent arsenal of destructive magic, picking each Minotaur Lord off from a distance is easy. And for your trouble, you get 2000 or more gold. Not a bad deal. Submitted by: Joshua K.
The count of Skingrad is very forgetful. Upon completion of the vampire quest (the one where you try and cure yourself of vampirism), he will offer you a reward for ending his wife's pain. However, he won't remember that he has given you this reward. The easiest way to win a battle against the enemy AI is to get to high ground (e.g. a rock) where the enemy can't reach you. High Acrobatics will let you jump high enough so the opponent can't follow you. Defeat them with ranged attacks like magic or bows. This must be the best light armor you can get in the beginning. Head to Leyawiin (the city to the south). Just outside the city, you can find a tomb called Amelion Tomb. The tomb is located to the north, on the eastern side of the "river". Just follow the right side of the river and you will get to the tomb, it's very close to the city. No house, but need a place to store stuff? Use rooftops to store your stuff. Stable buildings outside of towns work well. There's usually a way to jump onto the building from hills or rocks. Your items are out of sight and NPCs generally don't go climbing up on rooftops so your stuff stays where you put it. If you enter the console (~ key) and then enter "setdebugtext 10", followed by "TDT", it will output all the information about your skills and how close you are to gaining a skill point. Entering "TDT" again will toggle the display of information on and off. You can easily gain many skill ups for these two skills using a simple exploit. Sneak will increase as long as these conditions are met: There is at least one NPC near you, you remain unseen (the eye icon will be dark) and you are mobile. Meeting these requirements is easy enough. You only have to find a wall or corner close to an NPC that isn't in your direct line of sight. Find one that doesn't all that much, such as a guard or a goblin in a cave. Once you've found a good spot, enter sneak mode, face the wall or corner, and then activate auto-run. Your character will continue to walk into the wall, and providing you remain hidden, you can sit back and watch your sneak skill rise. NOTE: Turn off any light source (torches, light spells, etc) before you start. And, keep in mind that if your sneak skill is below 50, take off your boots or you will be detected. Make sure to beat the storyline first and then come back to side quests and dungeons because (this might be a bit of a spoiler.) In the end, the enemies will be the same level as you. So if your a high level (by doing side quests) all your guards will die because they are a low level and it will be nearly impossible to beat the game. Submitted by: Andrew G.
First off you need to have completed the Mage quest(s) to gain access to the university and have 5 grand soul gems. Enchant 5 pieces of armor for chameleon. You are now 100% invisible. Enemies will no longer attack you at all! You can steal right in front of guards. Try it out, and see for yourself. Submitted by: Shawn B. If you are unsure about whether or not you are under threat by an attacker, quickly enter sneak mode. If the crosshair is bright yellow, start looking around. Submitted by: Mitchell J. One of the most disheartening aspects of Oblivion is parting with valuable loot due to over-encumbrance. You can solve that problem by killing an enemy that falls to pieces, like skeletons or storm atronachs. Pick up a fragment of your fallen foe's corpse using the 'Z' button. You can store as much loot as you like in the tiny bone or whatever. Just carry the piece with you back to town, where you can sell or store it. Submitted by: Nikolai S.
When you are heavily under fire in an abandoned tower, run up the flights of stairs to the very top level. On the top level, you will usually find that there is a ledge onto which you can jump to put you out of reach of your enemies. From there you can take the time to heal yourself and prepare for a second attack. This also provides a good vantage point to gauge numbers of enemies who oppose you. Alchemy is one of the easiest skills to train. Just duplicate ingredients with the Dupe glitch (listed previously), and get on to making your potions. A lot of them. And you can sell the potions for a lot of money too! Related quest: On the quest where you have to rescue Hernantier from his Dreamworld, when facing the two Minotaurs in the Test of Resolve, save before you actually enter it. The Ayleid Cask is a random weapon spawner. The Greater Staff of Lightning will always be there, but the other two weapons are random. Free Money - Lots of It! This cheat will net you at least 6,000 gold every week. After you become Grand Champion of the Arena, you have the option of fighting 1, 2, or 3 Minotaur Lords. Normally these guys are pretty hard to beat. But go ahead and choose 3. But instead of running forward when the gate lowers, just back up. The Minotaurs can't fit their big heads through your hallway. Just stand back and zap them with spells, or run forward to attack then run backward out of their reach. If you start getting beat up, just back up and wait for your magicka to refill, then heal yourself or start zapping them again. One of the much-vaunted new features of Oblivion NPCs is that, unlike Morrowind, they can cross zone borders. So attacking someone and running to a different area just doesn't work anymore, right? Wrong. One thing I figured out is that while aggressive NPCs can cross zone borders, they rarely do so in masses, and sometimes they don't cross at all. I figured this out during the raid on Kvatch - when I entered an area with 6 or so hostile Daedra within striking range of me. I returned to the door directly behind me and was surprised when only one of them followed me through the zone crossing. On the road, NE from Skingrad to the Imperial City is a cave called Greenmead Cave. Inside is a very well fed Mudcrab. Submitted by: Anthony A. While playing through the Dark Brotherhood Quests you are given a horse called Shadowmere by your quest giver. The horse cannot die, but it can become unconscious. While the horse is unconscious you may access its inventory and place your loot that you don't necessarily want to get rid of, thus giving you an immortal traveling container that you can ride. Submitted by: Andrew S.